What is a Tip Calculator? 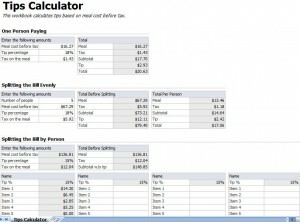 A tip calculator is a convenient tool to calculate how much you would leave for a tip when you go out to eat or drink. All you have to do is enter the amount of the meal or tab for yourself or the group, and the template will give you the amount that you need to pay. You can divide the tip among the group, or one person can for the entire amount. Who Can Benefit From a Tip Calculator? People who go out to eat on a regular basis will benefit from this template. It also benefits groups who go out to eat for lunch, or office groups who need to know how much to include in expenses.